Flat to negative opening is expected with choppy session ahead .... may pick up direction at later stage .Spot Nifty is trading in range and hovering around 20 DMA , it seems that bears may take control and drag it down towards 5850 60 spot . 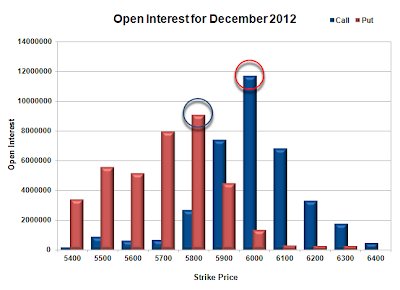 Trade in nifty futures according to these levels . 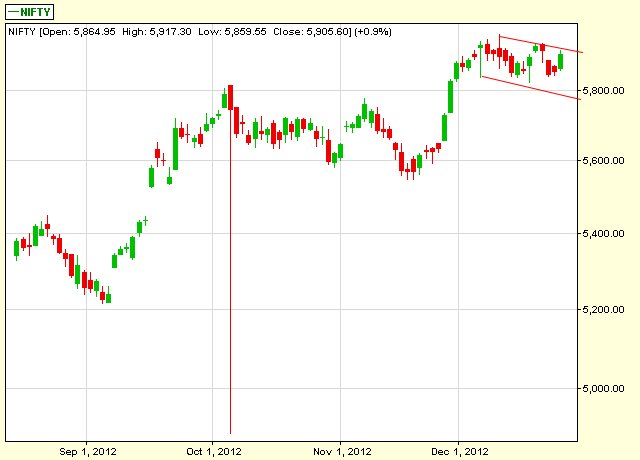 will it close positive or will correct by 5% to 6 % ? red arrows are showing swing highs. green arrows are at swing lows . Daily Nifty chart is showing that nifty is hovering around 20 day moving average which is at 5890 ...above it will be bullish and below that bearish..so break out will be above 5940 and break down below 5850 .
kailash123p@yahoo.co.in (12/28/2012 7:35:25 PM): 189 traded...3rd tgt done ..
R u waiting for dhanvarsha new year / Christmas offer ? if yes then avail it now !!!! and get full premium support , tips , daily news letter for 3 months upto 31st March 2013. 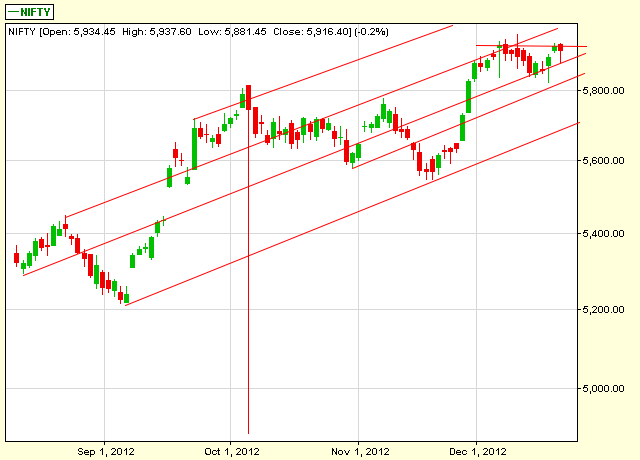 Taneja (12/27/2012 3:13:05 PM): pehle 5000 qty thi 5900PE ki @13.45 ,,then i booked at low ..
As per eod chart nifty trading in falling channel in short term .so today its range may be 5920>>>5780 . 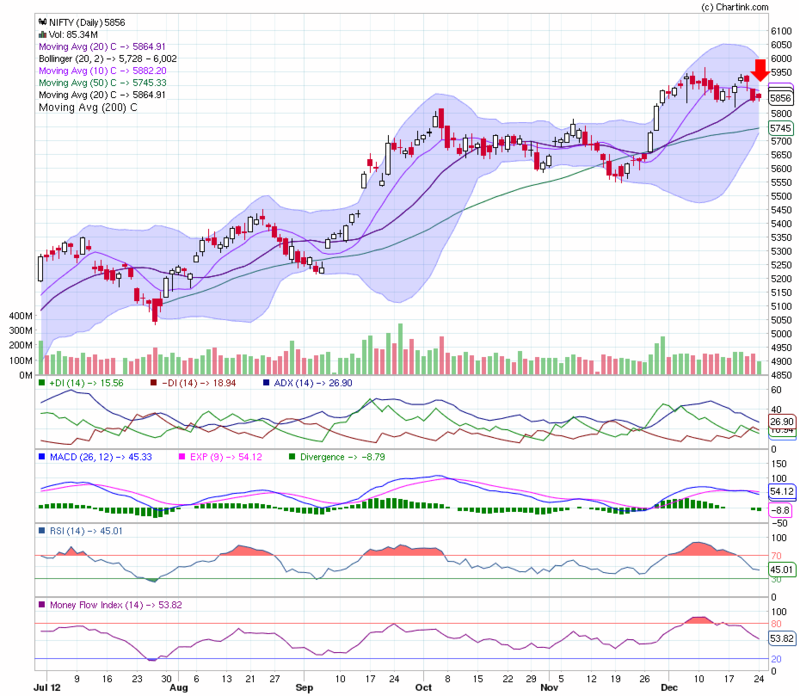 trading well above of 20 day sma at eod chart 20 day sma is lying at 5878 .
flat to negative opening is expected with selling pressure at higher levels . below 5878 more panic will be seen .as today is expiry so market will show wild moves not supported by technical indicators but a slight idea may get from open interest in calls and puts . highest calls build up is at 6000 and put buildup is at 5800.so as per current scene we can expect settlement around 5880-5920 which may change according to change in Nifty options OI . 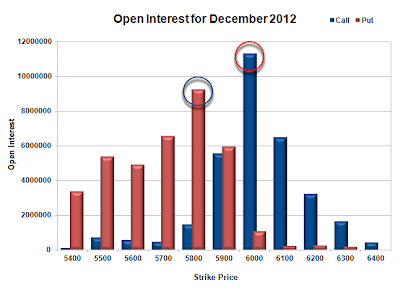 trade in Jan futures as per these levels . Trade with wider stoploss to protect your trade and capital for today's trades. 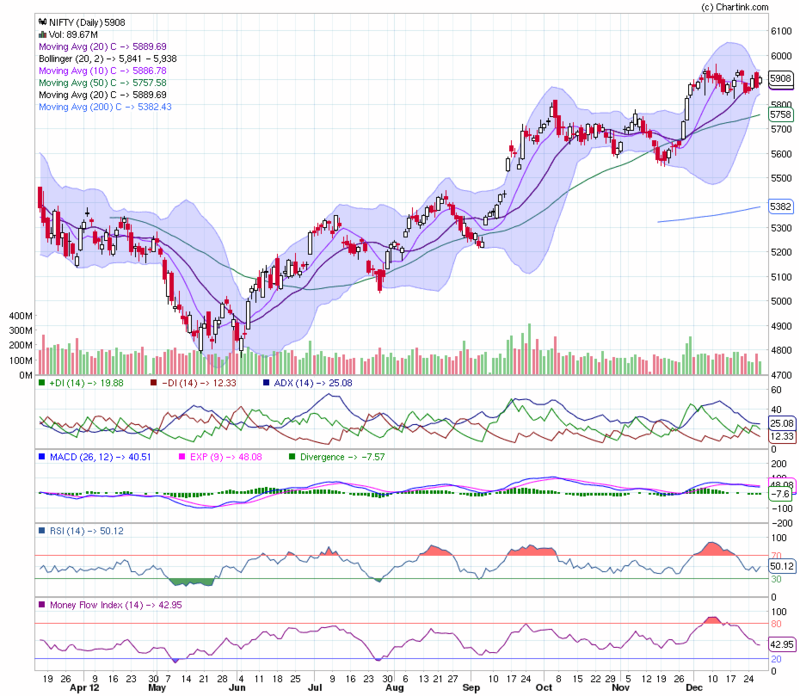 Flat to negative opening is expected with extremely volatile session ahead .Nifty is hovering around 20 day SMA which is trading at 5864 ...Bears are in power and will try to pull down nifty as soon as they can ...trade according to trend . Do not trade without stop loss orders . 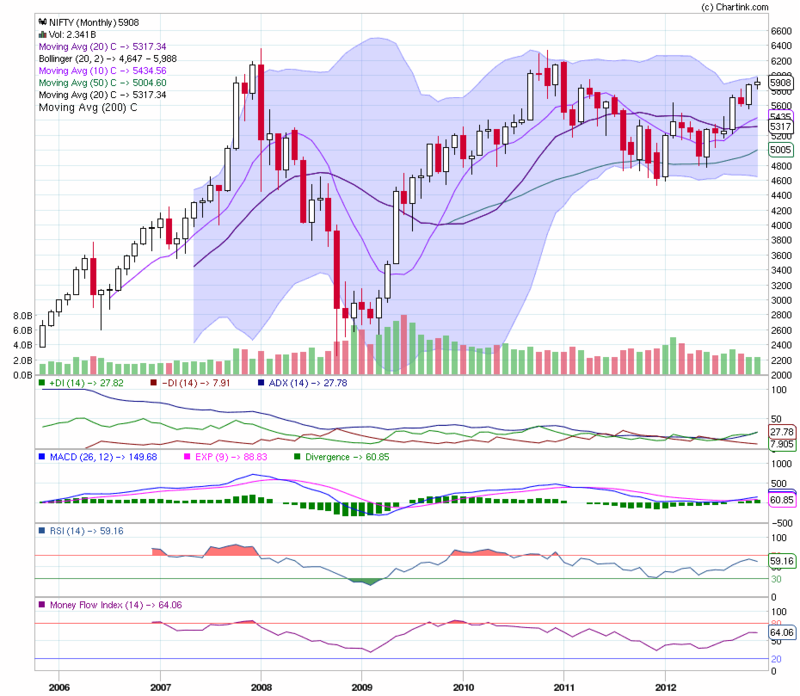 If do not know how to place stop loss just visit and learn it now ..
highest accumulation of 6k ce is indicating that 6k is far from bulls approach at least till tomorrow ..
kailash123p@yahoo.co.in Group (12/24/2012 12:30:05 PM): nifty spot is trading at 5856 so 6000 put at 133 is is 11 rs cheaper than its real cost ...why it is so ???? 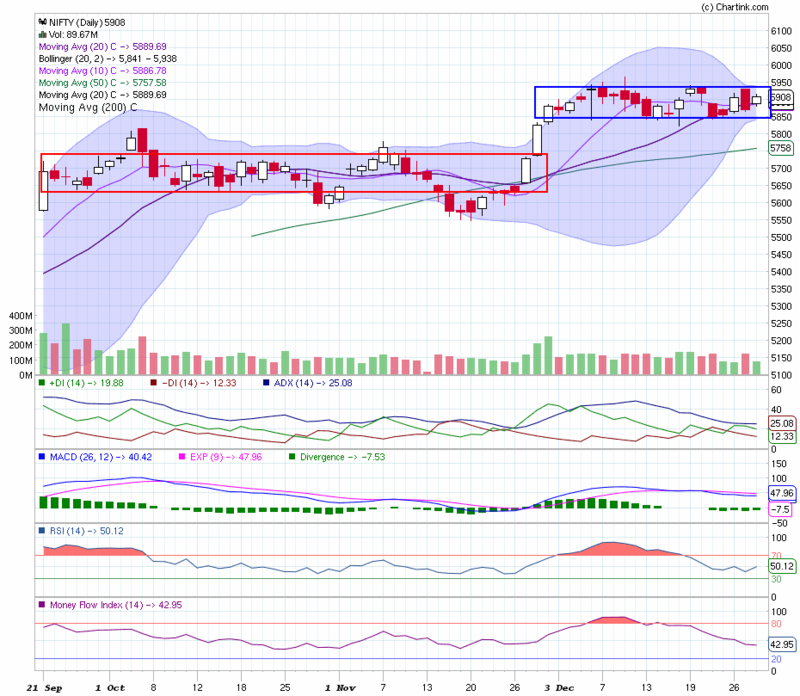 kailash123p@yahoo.co.in Group (12/24/2012 2:52:28 PM): buy and hold 6000 pe at 130 132 range. PooSai (12/24/2012 5:33:23 PM): once i read your blog.......how to place stop loss order ..
PooSai (12/24/2012 5:37:35 PM): i dont know sir...what is swing low. 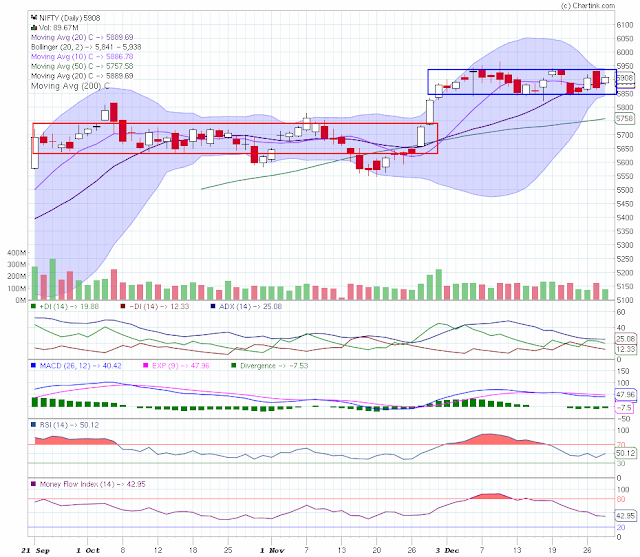 kailash123p@yahoo.co.in (12/24/2012 6:23:42 PM): lower highs means? Flat to positive opening is expected with 1 more dull session which may become warm after 2 to 3 hours of trade .tomorrow is Christmas holiday so options buyers wont take risk in OTM options and try to close intra positions today it self. 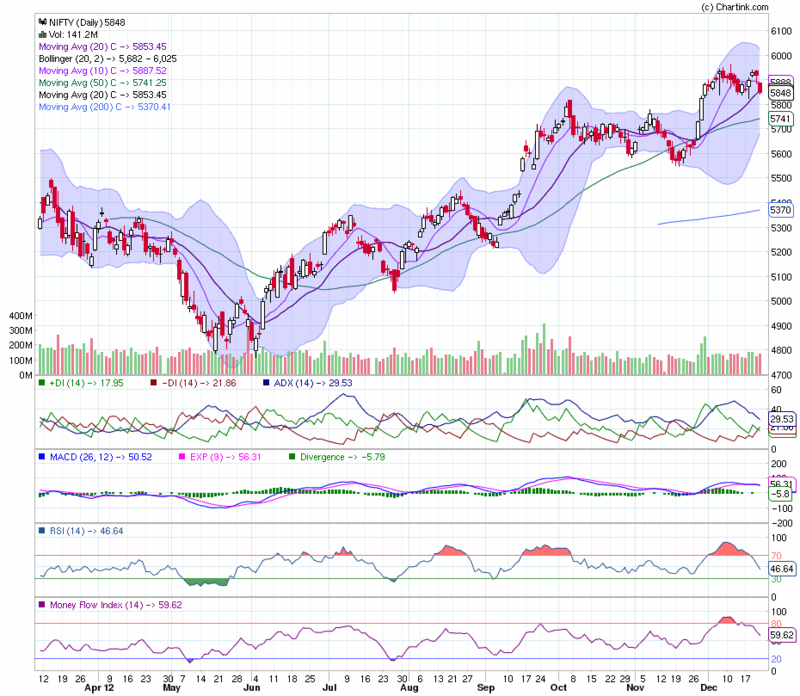 nifty is weak only below 5850 and trading around 5850 will create confusion in bulls and bears so we will see tug of war like situation in very short range till the time 1 of them will take lead of at-least 20 points . Last week it was posted "nifty will be in bulls grip if sustains above 5920... below 5850 bears will dominate ..."
Nifty remained in 5823 - 5939 range , weekly closed seen at 5847 just below 5850 ..
red shooting star candle at weekly chart is indicating that bears are dominating here. 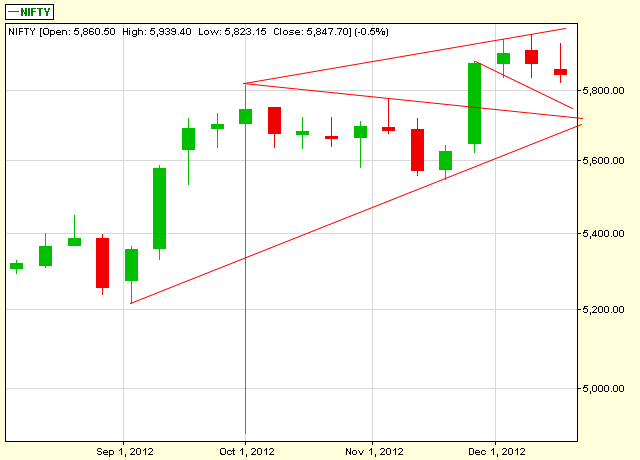 above 5850 bulls may pull it to 5940 at max .... next strong resistance is 5940 . Next week will be extremely volatile and truncated due to Christmas holiday . Taneja (12/20/2012 1:10:23 PM): yahan se market upar ya neeche ? will we see Friday effect at 2 PM ? not clear - where it will go !!!!! 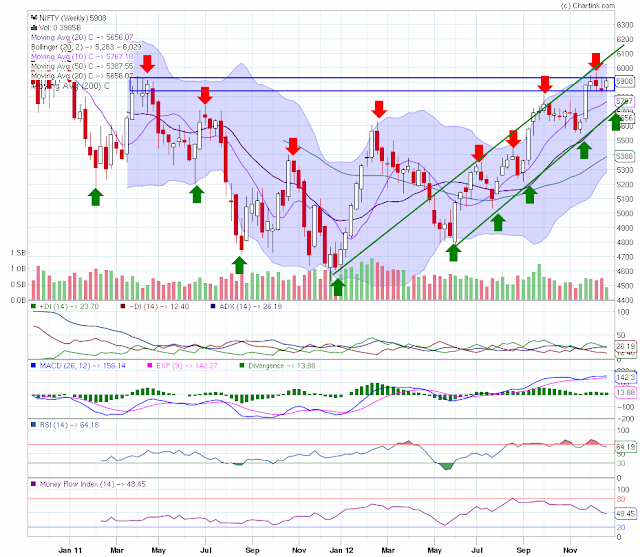 EOD nifty chart is indicating double top and red hanging man following spindle top with bearish engulfing candle too at channel top in extremely overbought zone where smart money is going out ..5 times failure attempts to cross 5930 is created at concrete roof here which can be broken by gr8 news like solution of fiscal cliff...and if before that bears will take the lead then we can see 5800 too. It is Friday ...the day of profit booking . 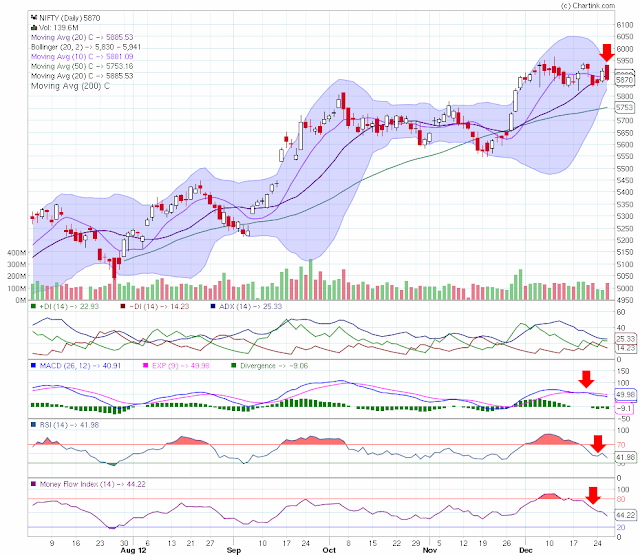 Volatility will be at peak and negative closing below 1 % can not be ruled out. Trade in nifty futures as per these levels..
kailash123p@yahoo.co.in Group (12/20/2012 2:00:03 PM): 1.59 PM now will 2 PM bring surprise ?? kailash123p@yahoo.co.in Group (12/20/2012 8:39:06 PM): 58185 double bottom or new low ?? ?